Welcome to the March 2017, edition of the Hillsborough Street Renewal, a monthly e-newsletter keeping businesses and residents along the corridor up to date on Phase II construction news. 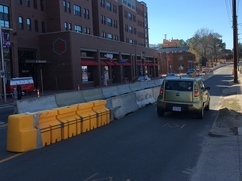 This March, Pipeline Utilities diverted traffic to the north and south side of Hillsborough Street between the Digitz Building and Cup a Joe’s, and crews started installing a sanitary sewer line in the middle lane closure. On-street parking is suspended at this location during the temporary traffic shift. Customers for the Stanhope Building businesses (CVS, Pieology, Smoothie King, and IHop) should use the parking deck located off Friendly Drive. Customers of Nice Price Books and Cup a Joe can park in the parking lot behind their building. The temporary traffic pattern is estimated to remain in effect for approximately 60 days. Duke Energy Progress (DEP) still has some poles along the south side of the corridor with the overhead lines. They are currently working to relocate their power lines from the overhead poles from Concord Street to Stanhope Avenue. Once this task is complete, they will remove the remainder of the poles along the south side of the street. DEP is scheduled to have the remaining poles along the south side of the road up to Stanhope Avenue removed by April 27. The hardscaping is starting to shape up along the south side of the corridor. Crews have been busy installing new curb and gutter and driveway aprons along the street. You can see new driveways aprons and concrete sidewalks near SubConscious and new driveway aprons at the former Zaxby’s. Crews have also installed a considerable amount of the brick sidewalk between Brooks Avenue and Dan Allen Drive and are currently installing the new sidewalks between Rosemary and Concord Street. 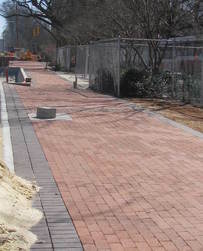 Construction crews will start setting bricks from Brooks Avenue to Gardner Street this week. Concrete and brick crews are leaving gaps in locations where DEP poles are in the way. They will circle back around to finish those locations once the poles have been removed. PSNC’s contractor, ITS is relocating a gas line at the Friendly Drive and Dixie Trail intersection this month. The scope of work in this location required them to close Dixie Trail at Hillsborough Street for a few days while they installed a 6-inch gas pipe. They will close Dixie Trail and Friendly Drive for a few days in April, while they make the final gas line tie-ins and connection in both intersections. On Friday, March 17, the south side of Hillsborough Street received a base coat of asphalt between Brooks Avenue and Gardner Street. Contractors planned to work on Saturday paving the utility cuts at Brooks Avenue and Founders Drive, but Saturday’s rain delayed that task. In the next few weeks, construction crews will continue to install the new curb and gutter, sidewalks, and other hardscaping features along the south side in preparation for construction switching to the north side. Contractors plan the north side production to take place from both the east and west ends of the project with crews meeting in the middle. Construction on the north side is already in progress at Shepherd Street where the vast majority of the underground infrastructure, such as storm drains and underground electrical and cable duct bank, is already installed. Shepherd Street is scheduled to remain closed through May while crews complete the remaining construction activities in that location. Once Pipeline Utilities crews complete the sanitary sewer installation in the center lane, they will start work along Daisy Street. Construction crews will replace and install new sanitary sewer, storm drains and water lines in that area. Once the underground infrastructure is installed, the new curb and gutter and brick paver sidewalk at Cup a Joe is scheduled for installation. 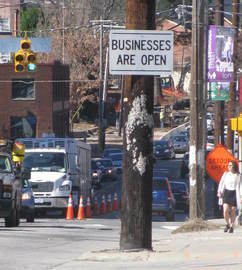 It is the City’s intention to maintain open communications and transparency during the Hillsborough Street, Phase II construction process. The City has a variety of ways for property owners, residents, tenants, and interested parties to stay up to date on Hillsborough Street, Phase II construction activity. The City holds monthly Hillsborough Street Coffee Talks. This informal meeting is currently held on the second level of the Stanhope Building (3100 Hillsborough Street) on the second Tuesday each month. The meetings are a great opportunity for the public to talk one on one with the Project Manager, Richard Dickie, and to stay apprised of Hillsborough Street, Phase II construction activity. The next Coffee Talk is scheduled for April 11, at 10 a.m. at the Stanhope Building. The project website is updated each week with the coming week’s construction schedule. The construction schedule includes where and what kind of construction activity to expect in the following week. 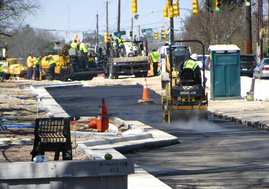 The website also has an email subscription option, and we send construction and traffic alerts to Hillsborough Street, Phase II subscribers, keeping them apprised of important information regarding construction. The Hillsborough Street Project maintains a Facebook page where we post project pictures and news related to the project. 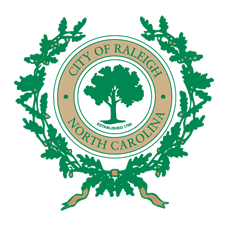 The Engineering Services, Roadway Design and Construction Division also maintain a Twitter feed @RaleighESDC, where we share information regarding our projects including the Hillsborough Street Project. It is important to follow pedestrian detours and not walk through construction zones along the corridor. The barricades and traffic control are in place for both the safety of construction crews and the general public walking, driving and biking through the work zone. With the upcoming north side construction activity, traffic patterns and construction zones will change. Please remember to drive slowly and be alert throughout the construction zone, and don’t walk behind the barricades, they are there to keep you safe.